Understand Your Rights Because You're About to Lose Them! Because You're About to Lose Them! Revolutionary War and Beyond's first book is now available! Understand Your Rights Because You're About to Lose Them! explains the basic rights listed in the Bill of Rights and shows how those rights are under threat as never before. We live in a time when millions of Americans are not aware of their history. Many people do not have even a basic understanding of the ideas of the Founding Fathers - the principles they believed in, fought for and even died for. Why the Founding Fathers wanted to replace the Articles of Confederation with a new Constitution. Why some Founders wouldn't accept the Constitution without the addition of a Bill of Rights. The history and purpose of each Amendment to the US Constitution in the Bill of Rights. The rights each amendment protects and why those rights are just as important today as they were to the Founders. Understand Your Rights Because You're About to Lose Them! instills a solid understanding of our basic rights as Americans. After reading this book, you will be sure to recognize government overreach when you see it by politicians. The days of Americans being ignorant of the Constitution and their individual rights must come to an end. By reading Understand Your Rights, you will be well equipped to help reverse the decay in modern American life. The America we have always known is disappearing before our eyes, but if we will educate ourselves about the principles in this book and put them to practice, we will see a turnaround in this nation and our BEST days will be ahead of us! It is a travesty of justice and human rights that the American Supreme Court has usurped so much power from the states and from individuals. Every person's conscience automatically knows that a small handful of people should not be allowed to make decisions for everyone else. It is the duty of every American to stand up and see that this usurpation of individual and state rights comes to an end. One of the most important things to gain from the 1st Amendment is that it constrains Congress from violating its list of individual rights. It leaves the citizens of each state with the authority to govern over these areas as they see fit. If one thing is clear, it should be that the Founding Fathers' intent was to have a small government with limited and defined powers. They will ignore history, ignore the plain meaning of written laws in the Constitution and violate every moral principle in order to see their wills enforced on the rest of us. Understand Your Rights is available in print and in ebook format. Ebooks are available in mobi, epub, pdf and other formats, so you can read it on all the popular e-readers such as Kindle, Nook, iPads and your personal computer. You can order the print version from CreateSpace (an Amazon subsidiary) here - Understand Your Rights. 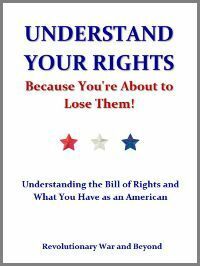 You can order the Kindle version of Understand Your Rights Because You're About to Lose Them! from Amazon here. If you would like to order the epub version for the Nook, you can order Understand Your Rights from Smashwords.com here. PDF, RTF, html and other versions are available from Smashwords as well.